It's a much more powerful take on the detachable laptop concept. 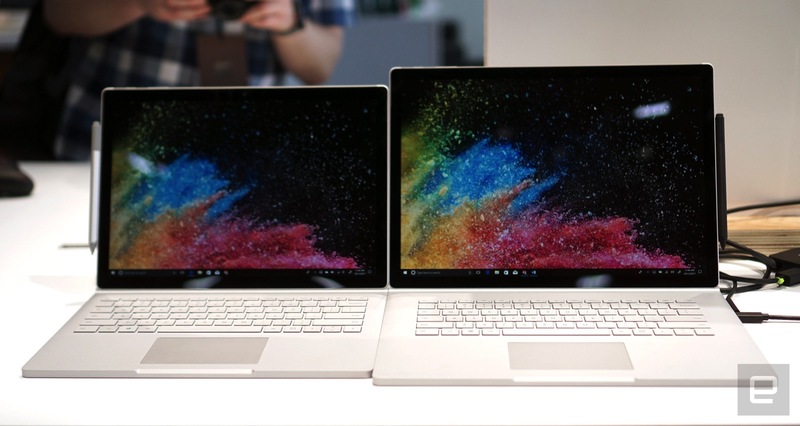 Microsoft's Surface Book has grown long in the tooth, to put it mildly: the base model hasn't been touched since 2015, and even the Performance Base version was really just a higher trim level instead of a true follow-up. At last, though, there's a proper sequel. Microsoft has unveiled the Surface Book 2, and this is much more of what fans of the detachable laptop-plus-tablet concept were looking for. It's more powerful, with quad-core 8th-generation Intel Core processors across most of the line and GeForce 10-series graphics on all Core i7 variants. However, the real star of the show is the addition of a second model: there's now a 15-inch version for those who are more interested in an expansive display than portability. The 15-inch touch panel is only slightly higher-resolution than its smaller counterpart, at 3,240 x 2,160. Microsoft was clearly focused on maintaining pixel density (it's slightly less dense than the 13-inch model at 260PPI) rather than dazzling you with a 4K screen. It weighs more for both the combined system (4.2lbs versus 3.6lbs or less) and the tablet portion (1.8lbs versus 1.6lbs), for that matter. However, you might not mind so much given the extra graphics power. The Core i7-equipped 13-inch model's GTX 1050 and 2GB of video RAM are respectable, but the 15-incher ships with a GTX 1060 and 6GB of video RAM. Microsoft claims the Surface Book 2 is fast enough to play games like Forza Motorsport 7 at a solid 60 frames per second in 1080p. While you wouldn't want to buy either laptop with gaming as the focus (you can clearly get more bang for your buck elsewhere), this makes the 15-inch rig a tempting option if you don't want to give up your game library just to try Microsoft's removable tablet design. On that note, Microsoft has refined the system in mostly subtle ways. The Surface Book's signature hinge has been tweaked to wobble less when you touch the screen, while there are promises of a faster, more comfortable backlit keyboard. Newer processors help the machine last for up to 17 hours in laptop mode, and 5 hours in tablet mode. And finally, finally, Microsoft has deigned to include a USB-C port in a Surface device. There's just one on each model (you also have two USB-A ports and an SDXC card reader), but it'll spare you from using a dongle to charge your phone or attach a newer external drive. We don't have full pricing as we write this, although Microsoft says the new range will start at $1,499/£1,499 when it ships on November 16th (pre-orders start on November 9th). Be prepared to pay through the nose to get the exact system you want, mind you. That starting price tag is for a 13-inch rig with a dual-core 7th-generation Core i5, 8GB of RAM and a 256GB solid-state drive. Opt for the 15-inch edition (which only comes in Core i7 form) and you're going to pay a staggering $2,499. These high prices aren't such a big problem now that the more affordable Surface Laptop exists -- it's just obvious that Microsoft sees the Book 2 as an upsell for buyers who need more horsepower.